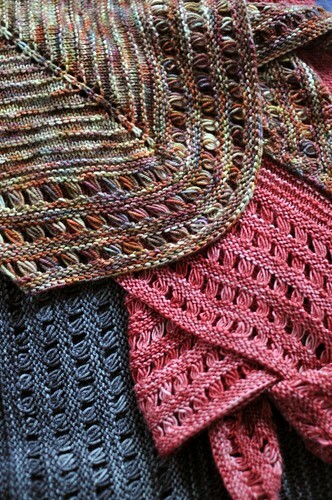 Some of you may have noticed that I’ve deactivated the Hibiscus shawl pattern from my Ravelry store. 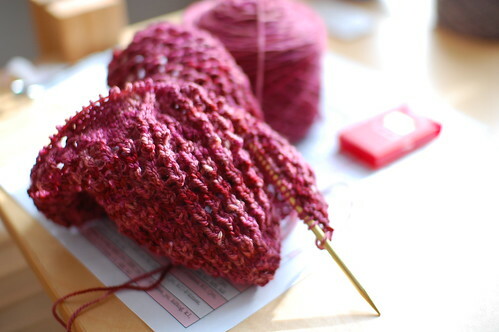 I’ve done this so I can reknit the pattern to investigate some problems that people have been having. I’m knitting it up in some nice merino sock yarn from Maple Creek Farm, a Rhinebeck vendor that has great yarn but I don’t think sells anywhere else! I’ve been working away at it and I’m almost done. I’m also taking this opportunity to add stitch counts throughout the pattern. The pattern should be back up for sale very shortly. I’m also going to continue donating a portion of the sales from this pattern to Haiti relief through February. I haven’t calculated the total for the January fundraiser yet, but I know it’ll be an amazingly generous amount! Thanks to you all for purchasing patterns and helping to donate. If you’ve had your eye on any of my patterns, you’ve still got one day to contribute a portion of the purchase price to MSF and the Red Cross. Hope you’re keeping warm this weekend. 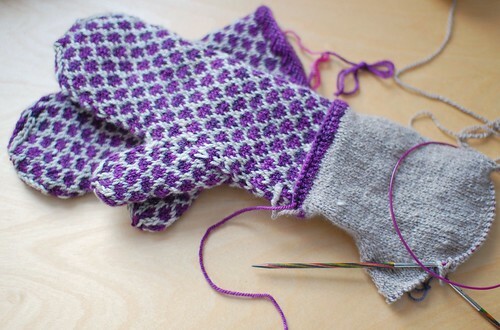 I finished knitting up the colourwork mittens I started last week – they were super fast since they’re knit in DK weight! Then came time to do the linings. I wanted to use Road to China Light, which is stupidly soft and gorgeous, but it was too thick. Guess I’ll just have to save that skein for a sweater project I’m dreaming up! So now I’m onto a really thin laceweight cashmere that I got at Rhinebeck last year – it’s very very soft and I think it’s finally doing the trick! Lesson learned, I need to go a lot thinner than I think for linings like this. The first couple of rounds, the yarn seems way too thin, but it all evens out after an inch or so. The slightly smaller lining should fit really nicely inside the outer mitten, and prevent my fingers from catching on the floats. I hope there’s actually cold weather to wear these in once I’m done. It’s been so mild and springlike here, it hasn’t really felt like winter at all. Thanks to everyone for your generosity – today I was able to donate $1000 to MSF! I have to wait a little bit for my credit card to clear up to donate more, but it’ll keep on coming. I’m planning to take a look at the end of the month and see what more I can send off. The yarn above is three different balls that I wound the other night, for three different new projects. Somehow I’m feeling a bit lacking in the sweater department at the moment – I tossed (donated) a bunch of sweaters when I moved and I’m sort of feeling the wardrobe gap. What I really need is some neutral coloured sweaters, so I tossed the stash for awhile and came up with these. Top one is Colinette Jitterbug for a lighter weight version of a side-to-side cardigan I knit awhile back (you know I don’t think I ever blogged the finished version, I’ll have to do that). 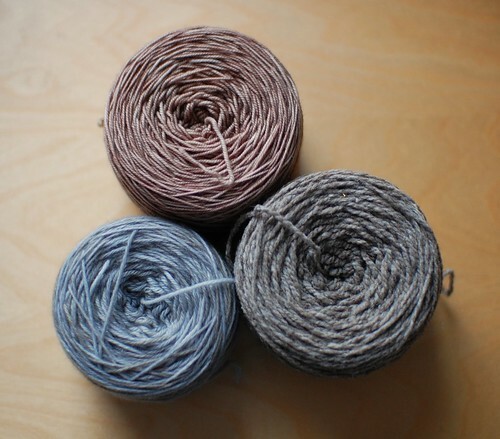 Bottom left is Handmaiden 4ply cashmere, less blue and more grey in real life. I only have 5 skeins which might be a bit tight for a sweater, but we’ll see. I might do a pullover instead of my standard cardigan. Bottom right is some label-less, DK weight merino that I bought at Rhinebeck in 2008. It’s super light and fluffy, really like a handspun with a really wholesome, rustic tweedy look to it. I’ve already cast on for a simple cardigan! My goal is to knock out a couple of really basic sweaters for everyday wear, since that’s what I seem to be lacking. Of course, it isn’t like I don’t have lots of other things to knit! One of my students asked me a few weeks ago how many projects I have on the go at once. Current answer is way too many, obviously. In my sweater-knitting mood I even dug up this brown Casbah sweater which has been sitting in a bin for over a year! The body and upper yoke are done and I just need to knit the buttonbands, and the sleeves down from a provisional cast on. I know I can’t just go casting on for more sweaters since then I won’t be able to finish any for awhile, and that’s not useful at all. So I’m going to try and buckle down and get some WIPs off the needles.